Designed for safe, comfortable transfers in and out of the bathtub. 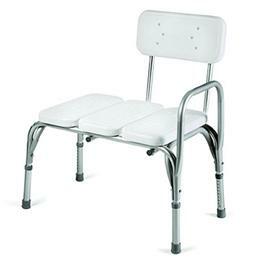 Provides sturdy, comfortable seating surface for individuals with restricted mobility. Reversible backrest accommodates right- or left-hand transfers. Features nonslip rubber tips, shower curtain opening and non rusting durable aluminum frame. Lifetime limited warranty. Height Adjusts: 28(1/2)" to 33"